“Swamp Ward” is a vernacular or local name for the area of Kingston that lies north of Princess Street to the west of the Inner Harbour — that is, it runs up along the west shore of the Great Cataraqui River to Belle Island. 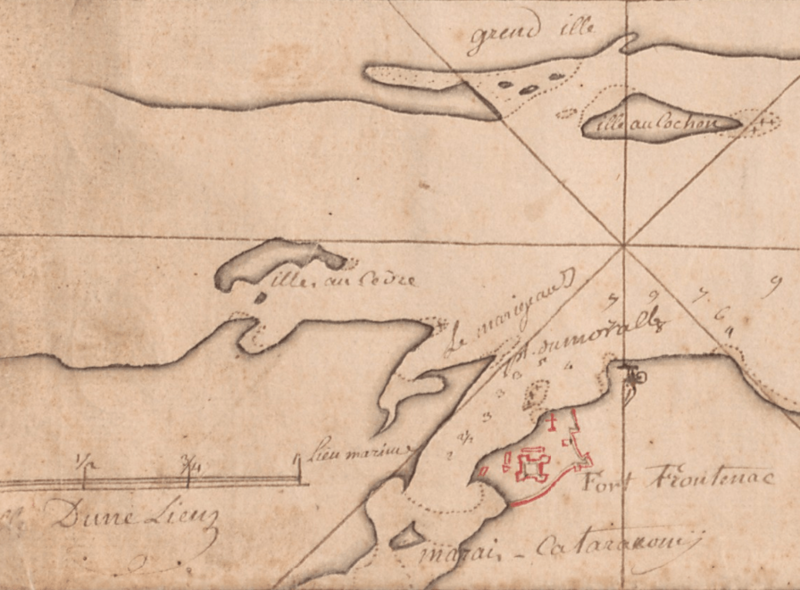 After British settlement in 1784, Montreal Street was built along the stable shoreline of the river, and everything east of it was (and is) on the floodplain. Historian Jennifer McKendry has found newspaper mention of the term “Swamp Ward” as early as 1871, where it was used as a (pejorative) synonym for the Cataraqui Ward – an electoral district. But SWIHHP interviews reveal that in living memory, the term has been more clearly identified with particular cultural and community traits and locations than with specific boundaries. At least until the 1970s when the Inner Harbour deindustrialized, the Swamp Ward had a strong working class culture and was the first point of arrival for most immigrants from other countries. Montreal Street between Raglan Road and Charles Street was an important commercial area and thus the main street of the neighbourhood. And Robert Meek & St. John’s Schools (both now closed) were neighbourhood hubs. “Swamp Warders” had to cross Princess Street for high school, to go to the cathedral, or sometimes to work, but they often defined themselves in distinction from people and neighbourhoods south of Princess. People who lived south of Princess did the opposite. Thus the valence of the term “Swamp Ward” was closely tied to who used it. By the 1980s, interviews suggest, younger people in the area no longer seemed to be using the term “Swamp Ward”; the more common name was “North of Princess.” When members of St. Paul’s Church started up the Swamp Ward Festival in the 1980s, the name was chosen deliberately to renew pride in a name and a neighbourhood they understood to be stigmatized. In contributing to the resuscitation of the name “Swamp Ward” in the twenty-first century, I may have contributed to muddying the waters (as it were) about the part of town it applies to. My improved understanding of the topography and cultural history of the area from many interviews and archival research now leads me to suggest now that properly speaking the Swamp Ward only refers to the area east of and including Montreal Street. After all, for example, the height of land at Sydenham Street or McBurney (Skeleton) Park could hardly be called swampy. But SWIHHP will continue to explore the larger area as defined at its inception in 2015. This larger area shares experiences of immigration, labour, deindustrialization, and, nowadays, gentrification; all of it has been neglected by historians and public commemoration and education. To hear people from the neighbourhood talking about what the term “Swamp Ward” means to them, listen to the first episode of Stories of the Swamp Ward. 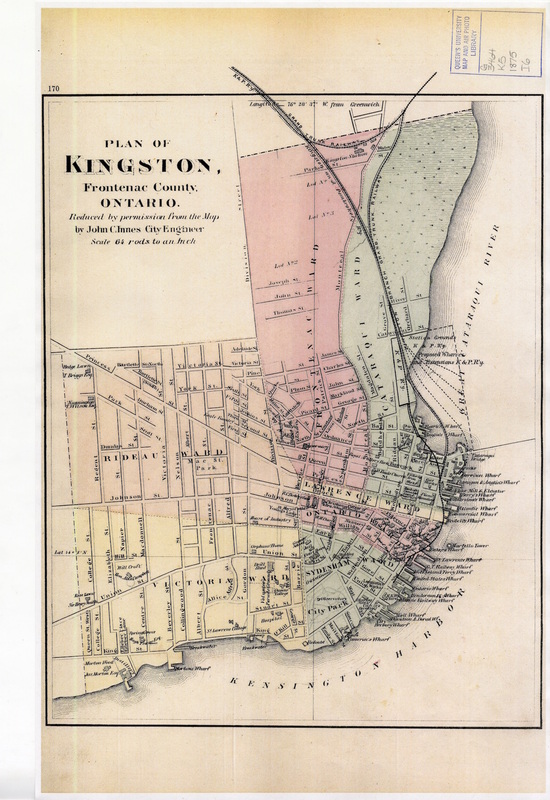 John C. Innes, Plan of Kingston, 1875, courtesy Queen’s University Library. 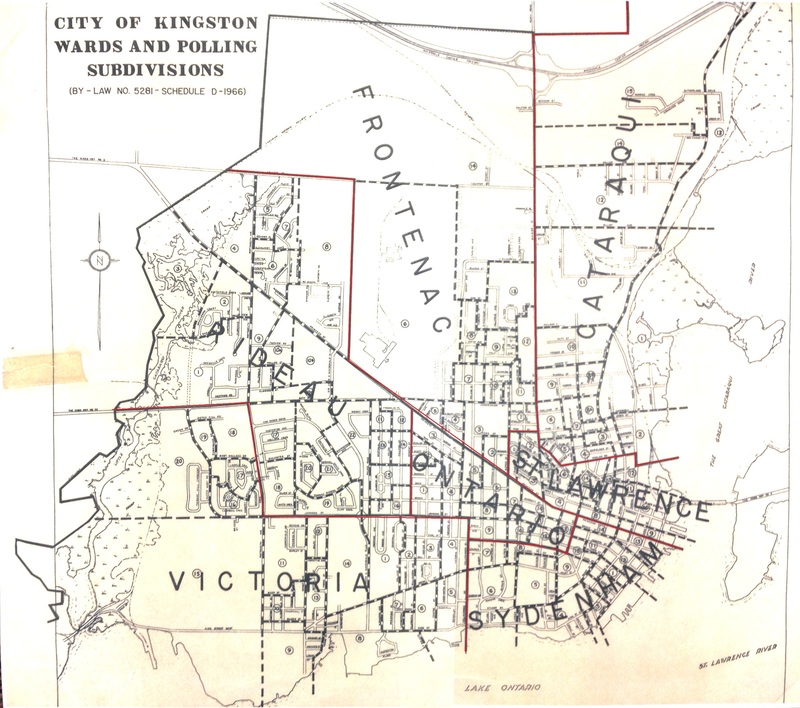 In 1875, the Cataraqui Ward took Montreal Street as its western boundary, and Princess as its southern boundary. The close-up reveals industry, wharves, and train tracks along the river. The tracks marked “proposed” and running through the water were never built, but indeed today’s Douglas Fluhrer Park is essentially infill between the train track and what was then the shore. Note too the marshes in which a tannery was later built north of River Street. In interviews conducted from 2015 to 2017, only Princess Street and the river appeared as consistent boundaries of the Swamp Ward; the north and west boundaries were understood in various ways. 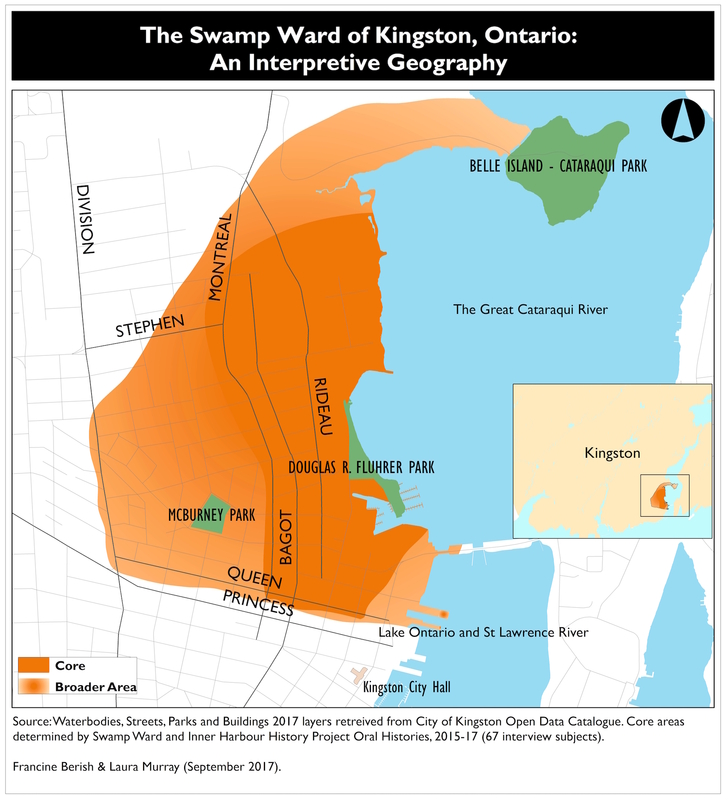 Only a couple of people I interviewed identified “Swamp Ward” as merely a synonym of “Cataraqui Ward.” To represent the ways people understood or used the term, I asked Queen’s map librarian Francine Berish to make a map. Interestingly, the mapping program Francine used could not easily cope with gradations of colour – it wanted a hard boundary where I was looking for “fade to white” at the edges. But the darker orange is if you will the heart of the Swamp Ward, and beyond that fewer people tended to apply the term. The dark orange area does match fairly well with the ward boundaries of 1875.